This base board is intended for evaluation and rapid prototyping with all D.Module2 DSP and Peripheral boards. All peripheral and most external bus signals are available on connectors and headers. 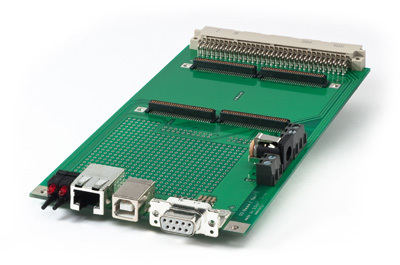 Equipped with a 96-pin DIN 41612 connector, the board can also be used in 19" 3HE systems as a carrier board and connected to a backplane. D.Module2 DSP and Peripherals boards can be stacked on the D.Module2 site, older D.Module peripheral boards can be connected via the SON.DM-DM2 adapter card. A DC/DC converter plugin-board is available to generate a +/-5V supply for analog data acquitision boards from the 3.3V DSP supply.